The Aircrew Labor In-Cockpit Automation System provides flexible automation architecture for existing aircraft to increase mission effectiveness and enable safe, reduced crew operations. 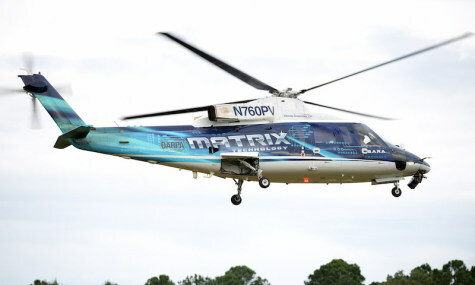 An S-76B commercial helicopter flew over a small crowd gathered at Fort Eustis, Virginia, landed in an adjacent field after adjusting to miss a vehicle, and rose up to hover perfectly motionless for several minutes. The mid-October demonstration was remarkable because the pilot carried out the maneuvers using supervised autonomy in an aircraft equipped with DARPA’s Aircrew Labor In-Cockpit Automation System (ALIAS). He operated the system via novel control interceptors and a tablet he had used for the first time just three days beforehand. “Hovering in adverse winds is a task that consumes a human pilot’s attention, but automated flight control achieves ‘rock steady’ precision,” said Graham Drozeski, the DARPA program manager for ALIAS, explaining how offloading pilots’ cognitive burden frees them to focus on mission execution. The U.S. Army pilot conducting the demonstration agreed, noting that as autonomous systems become more prevalent, aircraft systems can take on the role of a traditional co-pilot. “The Army refers to this as Mission Adaptive Autonomy. It’s there when the pilot needs the aircraft to fly itself and keep it free of obstacles, so the pilot can focus on more of the mission commander type role. But the pilot is able to interact with the system to re-suggest, re-route or re-plan on the fly,” said Lt. Col. Carl Ott, chief of Flight Test for the U.S. Army Aviation and Missile Research, Development and Engineering Center's Aviation Development Directorate. During the hour-long flight demonstration, Ott interfaced with the autonomous capabilities of the system to conduct a series of realistic missions, including aircrew tasks such as low-level terrain flight, confined area takeoffs and landings, landing zone selection, trajectory planning, and wire-obstacle avoidance. Before climbing in the cockpit, Ott practiced the mission plan with the ALIAS simulator, a tool that could help reduce mission planning and preparation time for future operators, allowing them to rehearse maneuvers in advance. Now in Phase 3, the Sikorsky engineers developing ALIAS have begun to integrate the system into a UH-60 Black Hawk for testing and flight demonstration in 2019. As the biggest fleet of aircraft in the Army and widely relied on by the Department of Defense, Drozeski said the Black Hawk is the ideal platform for ALIAS to quickly benefit service partners. -- The ability to rapidly integrate new applications including third-party algorithms and applications onto existing aircraft. FORT EUSTIS, Va. --- U.S. Army pilots exercised supervised autonomy to direct an optionally-piloted helicopter (OPV) through a series of missions to demonstrate technology developed by Sikorsky and the Defense Advanced Research Projects Agency (DARPA). "Future vertical lift aircraft will require robust autonomous and optimally-piloted systems to complete missions and improve safety," said Chris Van Buiten, vice president, Sikorsky Innovations. "We could not be more thrilled to welcome Army aviators to the cockpit to experience first-hand the reliability of optimally-piloted technology developed by the innovative engineers at Sikorsky and DARPA. These aviators experienced the same technology that we are installing and testing on a Black Hawk that will take its first flight over the next several months." SARA, which has more than 300 hours of autonomous flight, successfully demonstrated the advanced capabilities developed as part of the third phase of DARPA's Aircrew Labor In-Cockpit Automation System (ALIAS) program. The aircraft was operated at different times by pilots on board and pilots on the ground. The recent Mission Software Flight Demonstration was a collaboration with the U.S. Army's Aviation Development Directorate, Sikorsky and DARPA. The Army and DARPA are working with Sikorsky to improve and expand ALIAS capabilities developed as a tailorable autonomy kit for installation in both fixed wing airplanes and helicopters. "We're demonstrating a certifiable autonomy solution that is going to drastically change the way pilots fly," said Mark Ward, Sikorsky Chief Pilot, Stratford, Conn. Flight Test Center. "We're confident that MATRIX Technology will allow pilots to focus on their missions. This technology will ultimately decrease instances of the number one cause of helicopter crashes: Controlled Flight Into Terrain (CFIT)."